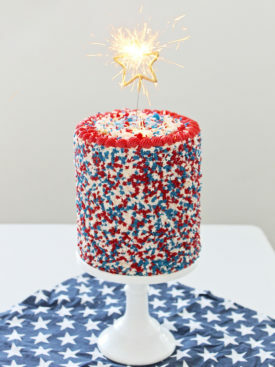 A patriotic funfetti cake, made with tender white cake layers, mixed with red, white and blue sprinkles, covered in a whipped vanilla buttercream. After a couple weeks away from the kitchen enjoying a little sand between my toes, it’s good to be baking again. I mean, yes, it’s hard to leave the fun-filled, carefree days of any vacation behind and return to the daunting tasks of unpacking, laundry, cleaning and loads of work, but I do love getting back into my routine. And part of that routine is baking! I’ve had several requests lately for a funfetti cake, so I thought the upcoming holiday would be perfect inspiration for this one. 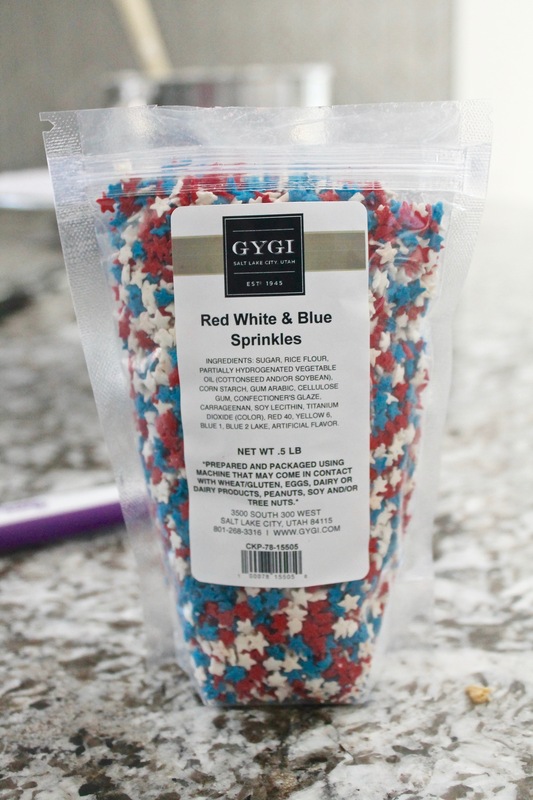 Of course, you can use any colored jimmies for this cake, but I do recommend using jimmies like THESE and not the sanding sprinkles. 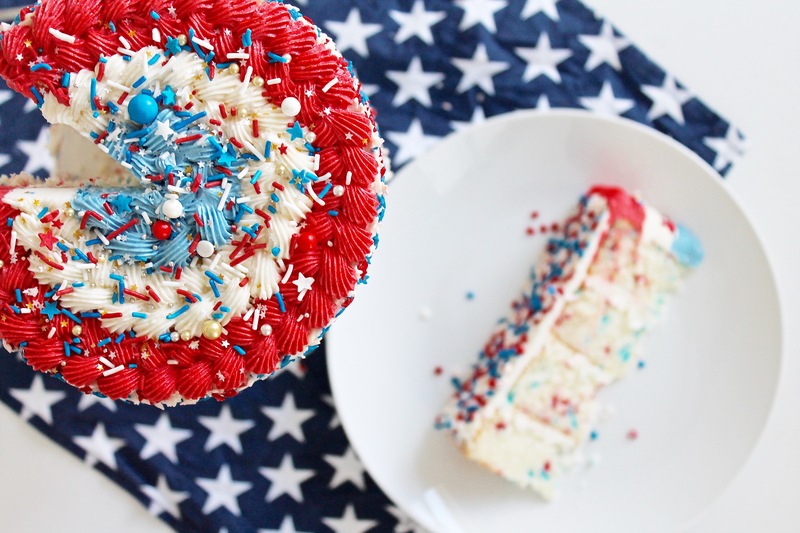 The sanding sprinkles you often see at the grocery store will bleed into the cake batter. The jimmies do a much better job of holding their color and shape. This cake is tender and fluffy, and full of flavor. You’ll actually notice in the recipe that I use clear vanilla extract. The clear vanilla extract has a slightly sweeter taste than pure vanilla extract and reminds me a little of the box mix flavor (but in a homemade-kind-of-way, of course!). To decorate this cake, I frosted the entire cake using 6-inch cake boards on the bottom and top of the cake. 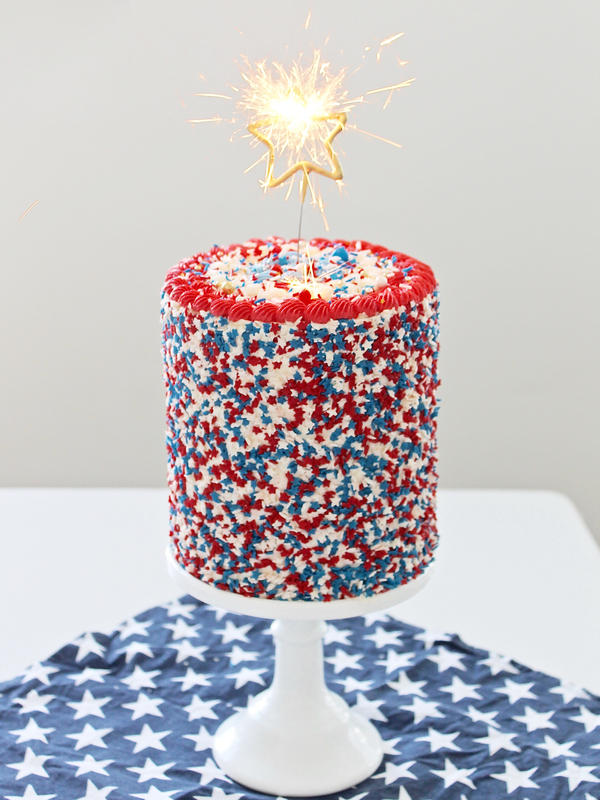 Once you frost the sides of the cake, the boards allow you to hold the cake horizontally and roll it in a jelly roll pan full of red, white and blue star sprinkles. It’s much easier than it sounds, and I have video on my Instagram account to show you how it’s done. You can also place the sprinkles on the side of the cake by hand. For the top of the cake, I used the Wilton 32 star tip to make a crossover pattern in each color. 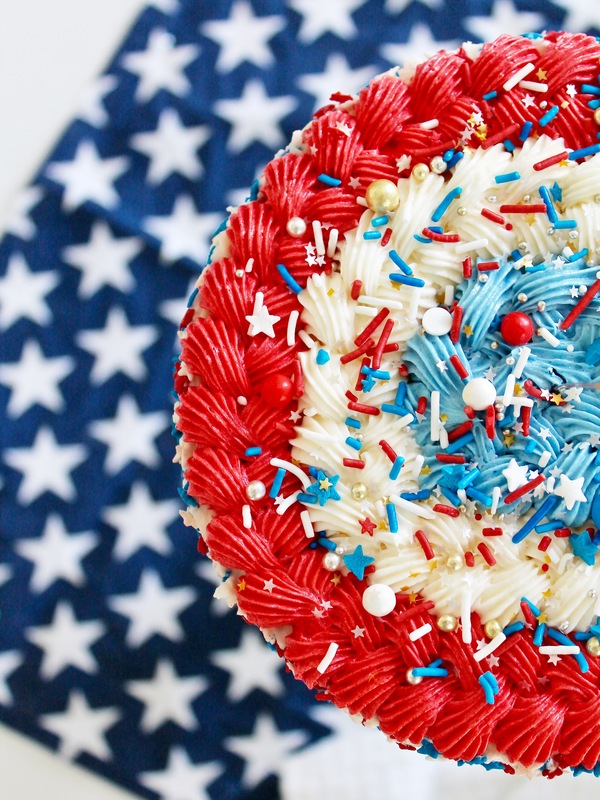 I also added some of Sweetapolita’s Party in the USA sprinkle medley for a bit more fun. 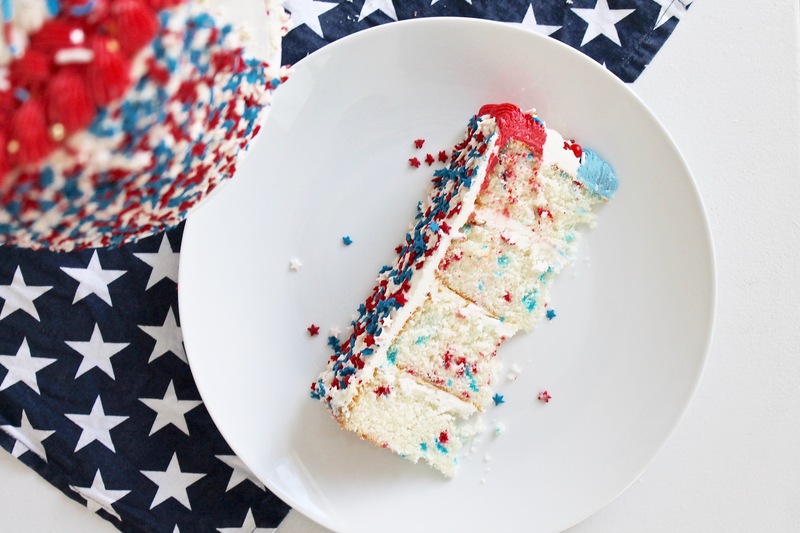 Tender white cake layers with sprinkles and vanilla buttercream. In a medium-sized mixing bowl, combine the whole egg, egg whites and clear vanilla extract. Set aside. Scrape down the sides of the bowl and add the egg mixture in two additions, beating on medium speed for about 20 seconds after each addition until just combined and all the ingredients are thoroughly incorporated. 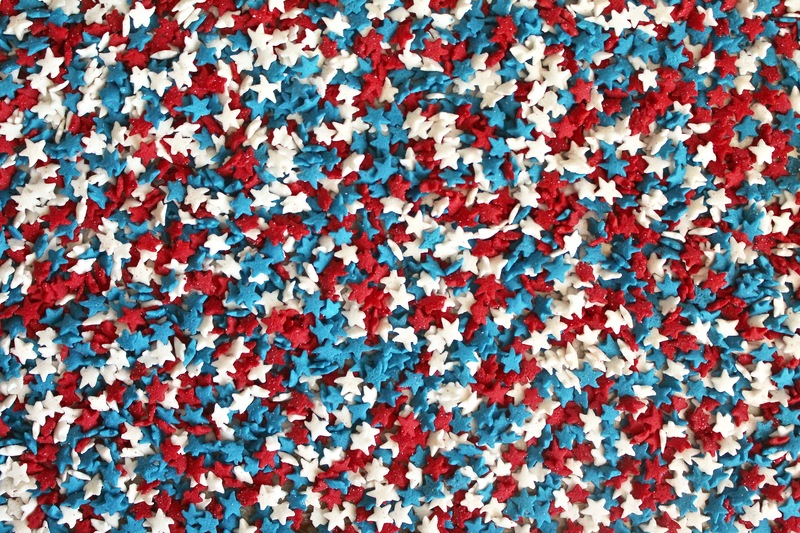 Fold in the sprinkles. Divide the batter into the four 6-inch pans or three 8-inch prepared cake pans, using a kitchen scale to measure equal parts in each pan. (Use about 11 to 12 ounces of batter in each of the four 6-inch pans or 15 to 16 ounces of batter in each of the three 8-inch pans). Bake for 20-25 minutes (my cakes took 20 minutes), or until a toothpick inserted into the center of the cake comes out clean. With the mixer on low speed, slowly add the powdered sugar, followed by the heavy cream, clear vanilla extract and salt. After leveling each of the cake layers with a cake leveler or serrated knife, place the first cake layer, top side up. For the 6-inch cake, add about 1/2 cup of frosting on the cake layer. For the 8-inch version, add about 1 cup of frosting. Spread over the cake layer as evenly as possible. Just making this for a family gathering, can’t wait! Just wondering when or if you add sprinkles to the batter? Maybe I am reading it wrong and miss that detail. You just fold them in at the very end before pouring the batter into the pans. If I don’t have extra large eggs do I need to add another large egg?? I do not have clean vanilla extract. Do I need to go out and search for some or can I get away with making this cake with regular vanilla extract? CLEAR Vanilla Extract I mean! I would suggest getting some, (which you can find at most craft stores actually), because it adds a bit of sweetness like the flavor from the box mix. Hi Heidi, I’m so sorry to hear that. This cake should be light and fluffy. Freezing them won’t change the texture – my guess is that you may have added too much flour, over mixed the batter, and/or overcooked the cakes. I always spoon in my flour to the measuring cups and level off with a knife. You want to do low speed on the mixer once you add the wet ingredients to the dry ingredients. And you oven may be running hot, so the time I give might have been too long. Hi, there your cakes are gorgeous. Can I uses this recipe for a sheet cake? And uses large eggs?? Yes you can. Bake for about 5 minutes less. This looks lovely! I’m hoping to make something similar for my son’s birthday! I was planning on making two layers in 10 inch rounds. Should I double the recipe and how long will it take to bake in the 10 inch pans? Thanks!!! I don’t think it needs to be doubled. I would just 1 1/2 the recipe.